I did not know games like Lost Sphear were still allowed to be made. Perhaps that says more for my tastes over the last few years than the actual development efforts of the world’s RPG studios. But look, if it wasn’t for the distinctive name, you would easily mistake Lost Sphear for being a remade SNES classic. 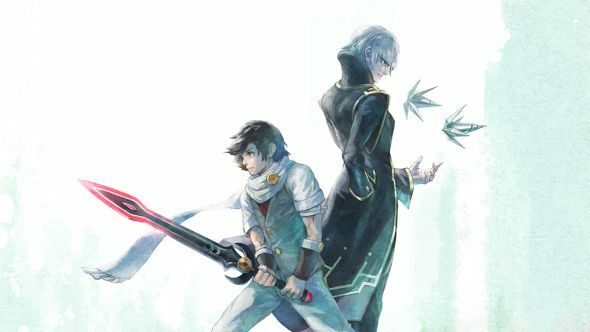 Beyond that however, Lost Sphear manages to modernise what it mimics in the best way possible – it exploits the simple art style and retro aesthetic to make room for more systems, more characters, more options, and simply more everything. For something to tide you over in the mean time, here’s the best RPGs on PC. Starting Lost Sphear is like stepping into a time machine, but when you go back it turns out valkyries are real and they ride laser raptors. History isn’t boring after all. To explain: you are immediately thrown onto a rain-soaked battlefield; nameless, faceless soldiers strewn about the place as a king slowly marches among the horror and has a last brief conversation with one of his bodyguards. The mystery is redoubled when a mecha suit lands in the centre of this otherwise medieval tragedy so that it and the king can immediately begin tearing chunks out of one another. Eventually – and obviously – the king gears up in his own version of what I later learned are Vulcanosuits, and unleashes a super attack to make the other lad retreat. Why is any of this happening? Who are these people? Is the king shouting at the mecha for a reason? All of it is a mystery, one that only deepens when you wake up as the typical hero-in-the-making sporting a recognisable haircut and a series of spunky companions. It was around about this point that I started smiling and found it difficult to stop, despite the sad and sometimes threatening overtones of the game itself. Dorky dialogue from every NPC, in every house, where you are free to wander and steal their money because they foolishly left it on the counter. It is so familiar, and so well executed, it can’t help but bring you joy. Similarly, it has a hell of a soundtrack, even in a time where blasphemy-worthy beats are becoming more and more common in games. A “You’re In The Shop” theme to rival Ocarina of Time and music elsewhere that effortlessly, wonderfully projects the themes of sadness, of a world losing itself, that seem to make up the plot. But it is not all nostalgia, and in fact, when it comes down to the brass tacks of gameplay, it is the freshest RPG I have played in some time. The callbacks to Chrono Trigger are still there but with far more freedom – you are able to position yourself where you like during the active time battles and move freely whenever you attack, turning what was happenstance damage bonuses into a deep and tactical system. Enemies will do the same, meaning positioning priorities change throughout a fight as you balance doing max damage with making sure your opponents’ follow-up doesn’t wipe you out. Grouping up is necessary to take advantage of powerful heals and buffs, but there is little point if your health is immediately depleted again thanks to enemy AOEs. While in standard encounters this doesn’t play out regularly, bosses bring all this together and require thought, planning, and counters to survive. With this increase in complexity and challenge come some issues. The exact order in which attack and defence moves happen is incredibly important as the action is only paused while you are issuing a command. While this can be cleverly used to wait for an enemy to move into a formation you can punish effectively, it also means there is an element of dexterity and quick decision making introduced. For example: the most challenging enemy I faced had a charm spell that mind controlled a party member. That character’s turns would then be spent attacking their former friends. 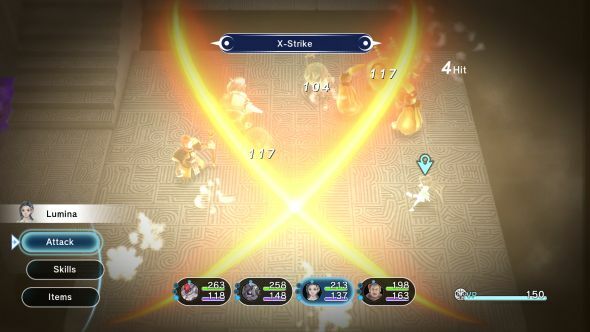 However, if it was that character’s turn while the AI was inputting the charm spell, and I could issue a command while the animation was happening, they would first perform the action I set and then wait for their next turn before fighting for the other side – meaning I would have a chance to heal the mind control debuff beforehand. Obviously, that is minutiae, but for a genre that usually stays well away from awkwardness like this, it’s jarring. A beneficial symptom of this problem is how much variety there is in the abilities of each member of the cast, and how the combat systems are designed to support that diversity. 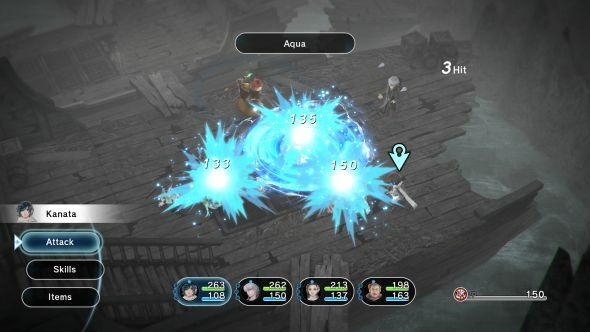 For example, one character has a unique resource of ‘bits’ that power up his abilities. Other characters don’t have access to that magic, at least in this demo, so it immediately set him apart. Even basic attacks can be as interesting and powerful as screen-long line attacks or big squares of damage. Those that aren’t still have a small area of effect, which means catching out enemies standing next to each other is a powerful move. Build on top of this a series of spells, special abilities, ultimate attacks, form changes, gear, and all the usual elemental weaknesses – it is a recipe for great fun and lots of experimentation. There are elements of this imaginativeness within the overworld and out-of-battle sequences too, where enemies can be dashed past at the cost of the loot they drop, which can be used to unlock secrets and areas of the world through the memory system that forms the basis of the plot. The world is forgetting itself, you see, and you are putting it back together. In the sequence I played, choosing whether to capture or save soldiers you were helping to fight was a minigame on top of simply completing the area. None of it is groundbreaking compared to where other genres have gone since 1999, but as extras to the meat of combat and as exposition, they work well. 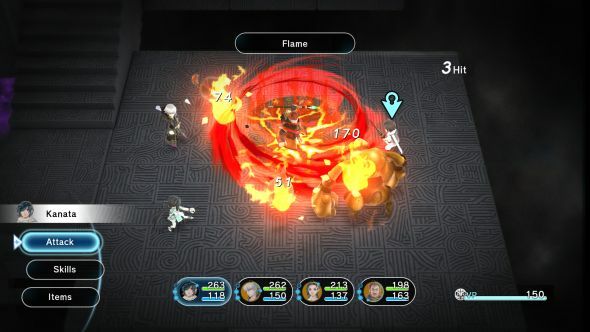 There are still elements I would like to see improved before the January 23 release date – it is the 21st century, we should be able to buy new gear, equip it, and sell what it replaced all in the same menu, thank you very much – but Lost Sphear is looking very promising. If I am able to find the time for another massive JRPG in my life, this one is top of my list to check out.